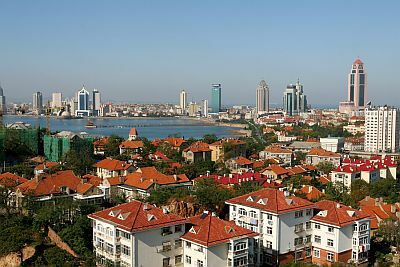 The climate of Qingdao (or Tsingtao) is slightly continental, with cold, dry winters and warm to hot, humid summers. The city is located in the Shandong province, in north-central China, at 35 degrees north latitude, on the coast of the Yellow Sea. In winter, the mitigating effect of the sea is reduced because cold currents prevail, which come from the interior of China and Mongolia, while in summer, the monsoon brings warm and humid currents of tropical origin. However, here as in the other cities of the Shandong Peninsula (Yantai, Weihai), the climate is milder than in the inland areas and in Beijing, and it's cooler especially in spring, when the sea remains cold after the winter. Precipitation amounts to about 660 millimeters (26 inches) per year; owing to the monsoon, the rainiest season is summer, while the driest is winter. Here is the average precipitation. Winter, from December to February, is cold and dry: the average January temperature is -0.5 °C (31 °F), but sunny days are quite frequent. Precipitation is rare and not abundant, however, given the low temperatures, there may be some snowfalls, generally light. The wind from the north can bring cold waves, with minimum temperatures around -10 °C (14 °F) or below, as well as the dust of the Gobi Desert. On other occasions, especially in December and February, there may also be quite mild periods, with maximum temperatures around 10/12 °C (50/54 °F). In spring, from March to May, the temperature increases, while rainy days become gradually more frequent. In March and April, the clash between air masses can cause sand storms; on the other hand, especially in April and May, in the days when the wind is weak, fog can form. Summer, from June to August, is warm to hot; as mentioned, owing to the Asian monsoon, it is the rainiest season. In June, and sometimes even in July, there are still mild days, during which fog can form. The amount of sunshine is fairly good, but considering the length of the days, it is slightly lower than in the other seasons. Periods of good weather can be hot, with highs around 35 °C (95 °F) and high humidity. August is usually the hottest and muggiest month. Autumn, from September to November, is initially warm, and gradually becomes milder, and then quite cold by November, but it can sometimes get cold at night already in October. The rains gradually decrease and become rare enough by November. The amount of sunshine in Qingdao is good all year round; however, in comparison to the length of the day, it decreases slightly in late spring because of fog, and in summer because of the monsoon. In Qingdao, the sea is very cold in winter, but it warms up a lot in summer and becomes warm enough for swimming from July to September. 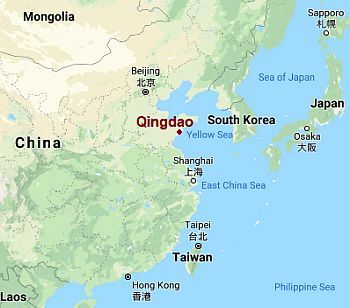 From July to early October (and occasionally also in the second half of June), Qingdao can be affected by typhoons, the tropical cyclones of South-East Asia. 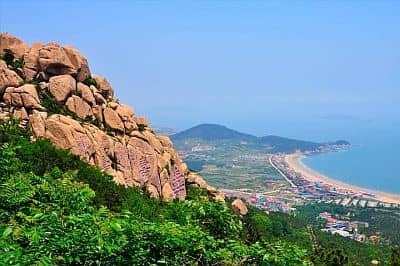 About 20 km (12 mi) north-east of Qingdao, we find Mount Lao (Lao Shan), 1,133 meters (3,716 ft) high, famous for hosting important Taoist temples, and protected by the Qingdao Laoshan National Park. Here, winter is freezing cold, summer is even rainier than in the plains, while in spring, when the coast is cool and shrouded in fog, the weather can be pleasant and sunny. The best times to visit Qingdao are spring and autumn, ie from mid-April to mid-June, and from mid-September to the end of October.